Colocasia esculenta popularly known as cocoyam is a tropical, perenial crop. It is a starchy tuber crop with three parts namely; corm, stem and leaves, which is grown basically for edible root. It can also be grown as an ornamental plant for the beautification of the environment as well as a medicinal plant. 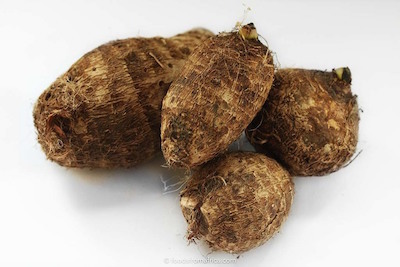 Cocoyam has its origin from Asia or Southeast Asia as some researchers have found out and it is a known staple crop in most developing countries of Africa. It can also be found in India, USA, Japan as well as Singapore. – It can also be prepared as a porridge. – Contains a good amount of protein, Thiamine, copper, calcium, niacin, manganese, vitamin B6, vitamins C, A and E.
– It also contains riboflavin,magnesium, phosphorous, iron,zinc and potassium. – IS COCOYAM GOOD FOR PREGNANCY? – IS COCOYAM GOOD FOR DIABETICS? – Cocoyam is also important for maintaining a healthy immune system. – The dietary fibre in it helps to protect the skin and give it a good glow. – It aids in the digestive process. – Supports the muscle and helps in decreasing blood pressure. Cocoyam should be properly cooked before consuption because it’s toxic in raw form due to high amount of oxalates. It should be eaten moderately, it is very high in calories. Next time you see cocoyam, don’t ignore the food (see Nigerian recipes here)… because it can offer you a lot of goodness! The article has been helpful because I wanted to make use of coco yam but my fears was that it contains only carbohydrates. In fact, I have been educated a lot. Thanks and keep it up.